Know the location of your main water cut off. In the event of a plumbing problem, cutting off the water flow from your municipality can save you from costly property damage. Minimize the risk of clogs by keeping kitchen drains clear. Don't pour coffee grounds, tea bags, egg shells, solid food bits or grease down the sink. Use a paper towel to remove grease from cooking tools and pour any excess into a used container with a screw top before disposing in the trash. In the bathroom, remove hair and other debris from sinks and tubs and dispose of it in wastebaskets. Never flush cotton swabs, scrub pads, diapers, sanitary products or similar items down the toilet; these items don't dissolve and can clog pipes. Drains that are seldom used can eventually have their taps dry out, leading to foul odors in your home. An easy remedy? Just pour ½ gallon of water in the drain to keep the water seal in the trap. Keep hard-to-grind items — chicken bones, banana peels, raw vegetables — out of your garbage disposal. Turn on the disposal before adding food waste, and let hot water run about 15 seconds; this will help flush waste down the main line. Clean your garbage disposal regularly by adding several handfuls of ice cubes into the disposer with the water running. This dislodges slime from inside. Follow this with half an orange or lemon for a fresh scent. Once a month, fill your sinks to the top with water, then release it to flush your pipes. Pull out bathroom sink stoppers and clean off any buildup. If you spot a leak anywhere – water leaks won't get better on their own. Direct Energy offers easy, cost-effective ways to protect yourself against unexpected plumbing expenses. 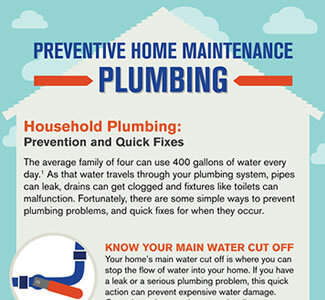 Browse our home plumbing protection plans, or call us at 1-888-733-1683 for more information.